(over 500cc), according to the latest figures from the Motorcycle Industry Association (MCIA). Sales data for 2013 shows that the Hinckley-based manufacturer continued to dominate the UK market with annual sales of 7,524 bikes. While many other motorcycle brands have continued to see sales fall during the past 12 months, Triumph saw its leading market share increase from 19.4% to 19.6%. Triumph’s continual investment in new product has been a key factor in the company’s consistent success in its home market. 2013 saw the successful introduction of a number of new models including the all-new luxury tourer, the Trophy 1200, plus significant updates to the class-leading Daytona 675, multi-tasking Tiger Sport and the ultimate roadster benchmark model, the Street Triple. This commitment to new product continued with the launch of five new cruiser models towards the end of 2013 – the Thunderbird Commander, Commander Light Touring (LT), America, America LT and Speedmaster, as well as a new special edition Tiger 800XC. 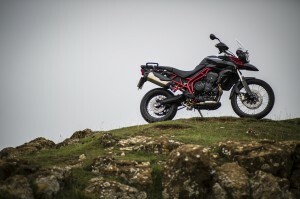 Unveiled at November’s Milan Show (EICMA) these models will arrive in UK dealers in succession throughout the Winter and Spring, with the Tiger 800 XC special edition due to hit stores in early February. Rick Cawley, general manager of Triumph UK, said: “Undoubtedly, our single-minded dedication to new model development is reflected in our success in the UK, and our growing market share around the globe. With a diverse line-up of 24 models, ranging from sports to cruiser, retro to adventure and streetfighters to luxury touring, we have something to suit virtually every rider. Underlining the firm’s success, Triumph was also awarded the prestigious Motorcycle Franchise of the Year Award from the industry title British Dealer News in December. This was the second year in succession that the UK manufacturer’s 52 strong franchise network scooped the accolade.